Where else other than Las Vegas? Standing 85 feet tall from the bottom of the pint to the top, the glass and steel structure is meant to be an attraction for a lounge that is to open soon “inside the pint,” said Paul Hennessey, owner of both Hennessey’s Tavern below and the lounge. “We want this to be iconic. If you’re in Las Vegas, you’ll need to get a picture taken with it,” he said. 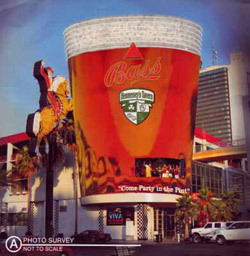 To make the structure look like a giant glass of Bass ale, complete with bubbles and a moderately foamy head, it will be wrapped in vinyl, similar to the technique used to wrap buses in multicolored graphics. It is to be completed within two weeks, Hennessey said. And sorry, St. Patrick Day revelers, there won’t be any alcohol or other liquid inside of it. Instead, the innards will be the Brass Lounge. Cynics could point out that a pint is, by definition, only 16 ounces. But Hennessey has a comeback for that. This would seem to rank up there with the world’s largest six pack and the world’s largest hop cone.